For the second consecutive season, the men’s basketball team made a run in an inaugural postseason tournament, but fell short in the finals. After winning their first three games of the CollegeInsider.com Postseason Tournament to advance to the finals, the Braves left empty handed falling 66-62 to the Old Dominion Monarchs Tuesday at Carver Arena. 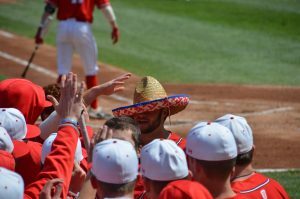 Although the final score may not have reflected the hopes of Bradley players, coaches and fans, the tournament did provide highlight-reel plays and exciting contests that supplied the returning players with extra experience. Director of Athletics Ken Kavanagh said he agreed. The fans started to catch on to the excitement as the Braves went deeper and deeper into the tournament. The attendance rose for each game, climbing from 4,472 to 5,007 to 6,114 and finally to 8,118 fans draped in red for the finale. Senior Theron Wilson scored 11 points and pulled down nine rebounds in his final game for the Braves. Sophomore Sam Maniscalco, 12, and junior Chris Roberts, 15, joined Wilson with double-digit scoring. All three players were named to the all-tournament team. 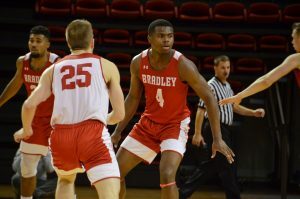 Bradley started the game hot connecting on its first 3-of-4 shots from long range to begin the game, getting out to a nine-point lead. But the Monarchs began to chip away, retaking the lead with four minutes to go in the first half. 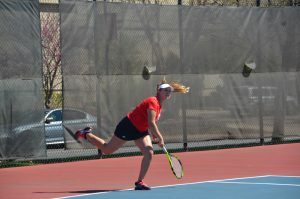 Senior Sam Singh said Old Dominion’s size made it tough for the Braves to maintain their lead. Bradley carried a streak of 16 consecutive missed 3-pointers into the second half and began to fall behind as time went by. After trailing by as many as nine points late in the game the Braves were able to pull within two on a jumper from Singh. But Bradley couldn’t get a rebound on the other end, and turned the ball over on the next possession allowing the Monarchs to pull away. The Braves held Old Dominion to just 42 percent from the field, but could not overcome the Monarch’s 18 offensive rebounds and 25 second chance points.